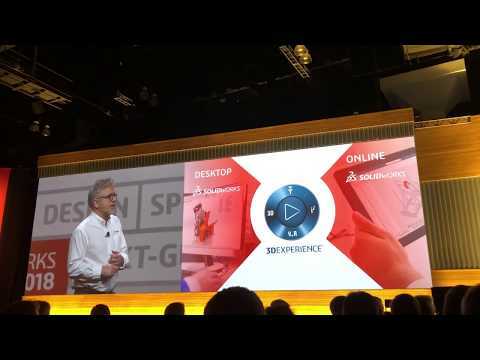 One of the announcements done at SOLIDWORKS WORLD 2018 was SOLIDWORKS 3DEXPERIENCE PLM services. Apology for extensive use of capital letters, but this is how Dassault Systemes Marketing wants us to spell these product names. So, what is about? From the last day keynote session, I captured the following video. No live demo was done, which is fine for keynote. Milos ZUPANSKI was presenting the product while talking with Solidworks’ Kishore Boyalakuntla. Watch the video and draw your opinion. Nice and slick demo presented very little of actual Solidoworks environment. Technically, it presented the way to get out of Solidworks via side panel integrated at the place where you normally can see variety of PDM and PLM interfaces. It reminded me ENOVIA R2017x product integrated with Solidworks. You might had a chance to read about it my earlier blog here. I compared ENOVIA Solidworks integration with new product – Solidworks Management in that blog. But here is my point. I didn’t find much difference. The following 2 pictures are presenting the paradigm of PLM services integration and ENOVIA 2017x. You can see it very similar. The difference might be in the data management and workflow. According to Milos, the data goes from Solidworks to 3DXPERIENCE (the same thing as it happened with ENOVIA). By moving data to the cloud it opens up to variety of options – it is available from every device, can be viewed from 3DEXPERIENCE viewer and used for many other purposes creating manufacturing bill of materials, project schedules, etc. So, again the same paradigm and the data will be duplicated in 3DEXPERIENCE platform. Which can put new PLM services project very close to any Solidworks integrated product getting access to Solidworks CAD files and parasolid data. Milos and Kishor mentioned SOLIDWORKS xDesign that will be seamlessly integrated in the same scenario. This is much more interesting because xDesign is actually run on top of 3DEXPERIENCE platform and capable to store data seamlessly with ENOVIA. However, it is clear to me about data handover between desktop Solidworks, xDesign and 3DEXPERIENCE. My hunch, it will be somehow related to earlier presented strategy of POWER’BY – you can read more about it here – POWER’BY – the name of 3DEXPERIENCE PLM Overlay.